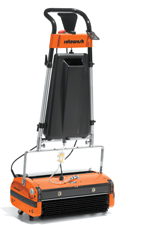 Our single pass machines feature frontal located water-jets, allowing for the entire cleaning process to be completed in one motion, producing outstanding results with maximum efficiency. Single pass machines are especially useful in larger areas such as sports halls, long corridors or shopping centres, though their unique maneuverability makes them equally effective in confined areas. To comply with European legislation for commercial cleaning machines, Rotowash machines are fitted with an “Operator Presence Control (OPC)”. This operator safety device automatically stops the machine motor in the event of the handle being accidently dropped. Sometimes also referred to as a “dead man’s handle” it switches off the machine power when an operator is not in control. 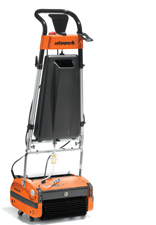 Highly manoeuvrable in confined spaces, equally effective in large open areas. 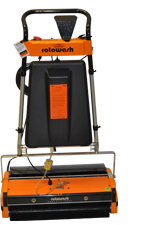 We would readily recommend Rotowash to anyone thinking about purchasing a top quality floor cleaning machine. There may be cheaper ones out there but quality lasts and the backup service is top class too. Isn’t that what we all should be aiming for? Thank you Rotowash, and we look forward to many more years of excellent service.